We understand that individuals have specific preferences when it comes to drying hands, so we provide all available options. Efficient hand drying is as important as hand washing itself, as wet hands can attract bacteria, becoming a health hazard and spreading germs to all areas of your business. Reducing the risk is easy - providing hand drying solutions suitable for all washroom environments is our business. With our range of cabinet roller towels, roller towels and warm air dryers you can instantly improve hygiene standards leading to a reduction in employee absenteeism and improved productivity. Our highly trained personnel will come to your premises and apraise your specific washroom requirements, taking into consideration important factors such as the amount of traffic your washroom receives, the frequency of servicing that can be provided and the cost implications that the different types of hand drying methods present to your business. From this free consultation we will recommend the correct hand drying solution for your business to ensure your washroom visitor is catered to. KeyHygiene's hand drying solutions are purposely designed for ease-of-use, maximum hygiene and cost control maintenance. Whatever option you select, whether cabinet roller towels, roller towels or warm air dryers, our recommended hand drying solutions will successfully meet the needs of your business and your washroom visitors. KeyHygiene's range of Warm Air Hand Dryers provide the complete solution to all hygiene requirements in washrooms. Our range includes Automatic, Manual and Recessed Models that are suitable for many applications in pubs, hotels, restaurants, hospitals, nursing homes, shopping centres, sports stadia, leisure centres & offices. 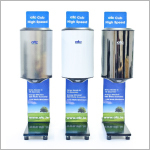 Our range of Hand Dryers are more energy efficient, promote cost savings, improve hygiene, are environmentally friendly and are easy to maintain. Cabinet Roller Towels are specifically designed for hygiene, comfort and cleanliness in the workplace, being a low maintenance and convenient hand drying method. The used towel is kept separately from the clean towel, providing a fresh portion for each user and prevents cross contamination. A typical towel roll provides around 200 portions of towel. The cotton towels are both strong absorbent, and with no waste or electricity requirement are both an economical and environmentally friendly option.